Rootes Building is on the piazza in the centre of campus, directly facing the Students’ Union. Next door you can find Costa where you can meet your friends for work or fun over coffee, or pick up a quick sandwich or snack all day long. The Learning Grid Rootes is situated on the ground floor of Rootes Building and provides a space for students to study on campus that caters for both collaborative and individual work. On the first floor is Fusion serving authentic Asian cuisine and the bar, serving a selection of bottled beers, wines, spirits, guest ales and craft beers. It is the only venue on campus showing live sporting events on Sky Sports and BT Sports with four screens dedicated to a wide variety of sport. A great place to relax with friends over a game of pool or table tennis, it is also popular with societies who often hold their socials here. Finally, on the second floor of Rootes Building, you will find large conference rooms such as the Panorama Room, where you may sometimes sit exams but which will also prove to be the host of countless career open days and employer presentations. 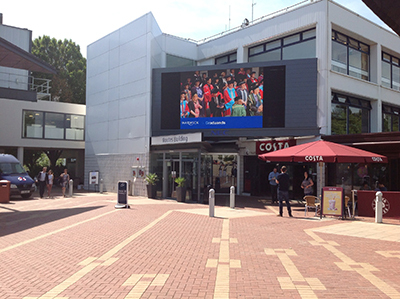 The big screen broadcasts a range of content throughout the year - from live streaming of our graduation ceremonies and news updates to films, sports competitions and the Eurovision Song Contest! Accommodation is next on our tour.